Recently I commented on Beth Finke’s Safe and Sound blog, Taking Uber with a Guide Dog: Jury Still Out regarding Uber and transporting people who use service animals. This discussion is important to raise awareness of this valuable transportation option for individuals with vision loss and to ensure that service dogs are accommodated. Here is my response and my experience using Uber. For the last few months I have had to piece together rides to get to my train to get downtown to work. I’ve accomplished this with a paratransit ride or two, my son when he’s available and Uber. I had worried that an Uber driver would refuse to take me and my guide, but I have found the opposite to be true. That being said, I did have one driver at first refuse to take me, then reluctantly did so. On my rating after the ride, I gave the driver a “1 star” and wrote a short comment explaining what happened. I received a response back almost immediately from a real person, with apologies, a promise to talk with the driver about taking service animals and a credit of the cost of my ride that day. I wrote back telling Uber that this driver had been the exception and that all the other drivers were more than accommodating. As far as taxi drivers, I did have a driver refuse to take me and my guide. I filed a complaint with the Commission on Human Relations through the city of Chicago. I never heard anything and when I followed up, I was informed that the driver did not show up for his hearing and there was nothing else that could be done. I have been using Uber so much that I have become a valued customer and this week my rides are 60% off. This makes my short ride to the train station cheaper than a paratransit bus — we won’t go into the perils of riding that transportation system in this post! Let’s give Uber a chance to prove they are working to accommodate people with service animals. Uber has been a Godsend for me since taxis in my neck of the woods are limited or nonexistent. 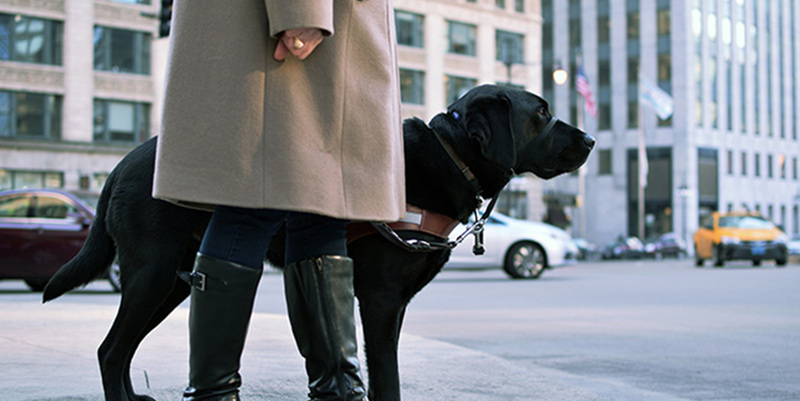 Note: On April 30, Disability Rights Advocates reported that Uber and the National Federation of the Blind of California reached a settlement to address discrimination issues with Uber drivers and service animals. Read the steps Uber has agreed to comply with: Ground Breaking Settlement to End Discrimination Against Blind Uber Riders Who Use Service Animals. Kathy is the Community Engagement Specialist at Second Sense. She and her guide dog, Weller, use public transit to get to work every day. Nice post. Even though it can get pricey, I do like Uber better than paratransit. I just need to get better at using the app! You can always ask David Flament for some tips or talk about any issues. He uses Uber regularly and has written posts on using it in the past. Stella, it took me several times to get the hang of the app. As with anything, it got easier the more I did it. Pricy, yes, but reliable, `absolutely. Stop by and I’ll show you. Funny, when you left that comment on my post about Uber, I thought about contacting you to see if you’d like to write a guest post about this for our Safe & Sound blog. Work got in the way and I never got around to contacting you, but then, abracadabra! Your post is here — good work and thanks for opening my mind a bit about all of this. Your point to “give Uber a chance” is a good one.